Salam Aleikoum, welcome to Morocco ! 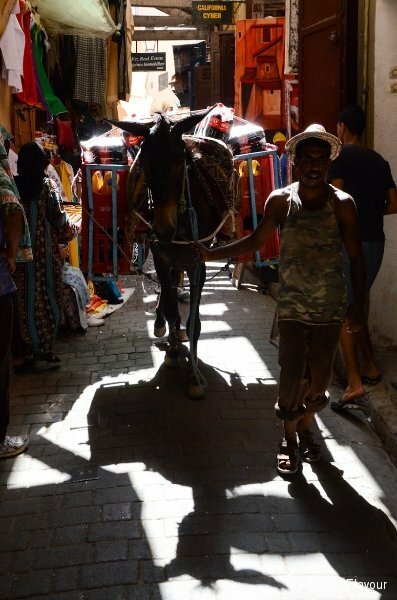 We arrived in Morocco on August 1, 2013. We cross the border via Ceuta and start riding towards Tetouan. Along the road, the scenery is deserted. Houses are silent. Shops are closed. The ghost train of the theme park is certainly made of real ghosts… Gardeners water the lawn along the road: they are the only living souls. Which illness this country is suffering from?! Surprise! In Morocco, the August 1, 2013 is also the 23th day of the month of Ramadan. The country does not suffer: the country lives at the rythm of Islam. 98% of Moroccans are indeed Muslim and, during the month of Ramadan, they fast from dawn to sunset. They feast during the night (between the Maghrib prayer, which breaks fasting, and the Fajr prayer, which announces the beginning of fasting), get up late and live slowly to hold until the night. It is 2:00pm when we arrive at M’diq, 30 km South of Ceuta. First thing to do: withdraw money. Here is the dirham (MAD: maroccan dirham). Roughly 1 euro = 10 dirhams. This is perfect, we should get by fine with conversions. The first two ATMs do not want to hear anything, but fortunately, the third one is more docile. At the market we buy a Melloui (puff pancake made ​​from wheat) for 2.5 dirhams and Baghrir (pancake “thousand holes” made of wheat as well) for 1 dirham … A priori, it should be easy to keep our budget of 10 euros per day and per person! Around us, fields of plastic bags. Literally. We brave the stench to take a photo. 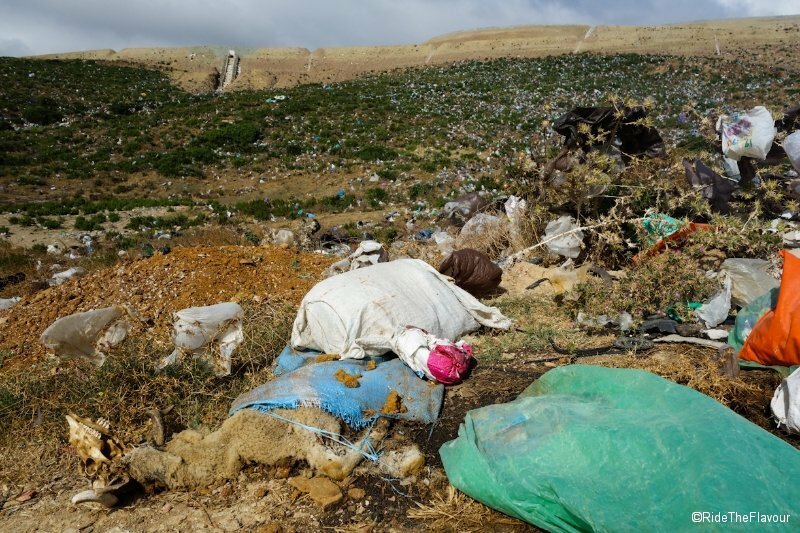 Moroccans do not care about the ecology yet and simply throw their waste in nature. 40 km later, we arrive at Beni Hassan, a “village-street”, and stop at the first café. We are in northern Morocco and here, the second language is not French but Spanish. We, proud settlers, are quickly disillusioned … At the café, one man speaks a few words of French. We explain that we want to recharge our batteries and find a place to sleep. Others mingle in the conversation, and 10 minutes later, we sit in the cafe chatting with Lahcen. He jabbers in all languages ​​and we come somehow to exchange words. Around 8:00pm, as the last sunrays disappear behind the mountains, the traditional Ramadan meal is served: soup (“harira”), eggs, bread, dates and milk. Fatigue overwhelms us shortly after. We are in an atmosphere of trust: we bring the bikes in the cafe and lie down in a corner of the cafe. Despite the night fizzing that fills the coffee with life until late, we sleep deeply … You cannot get used to the rhythm of Ramadan in a snap! The city emerges at the foot of the mountains, explosive in the rural scenery that surrounds it. 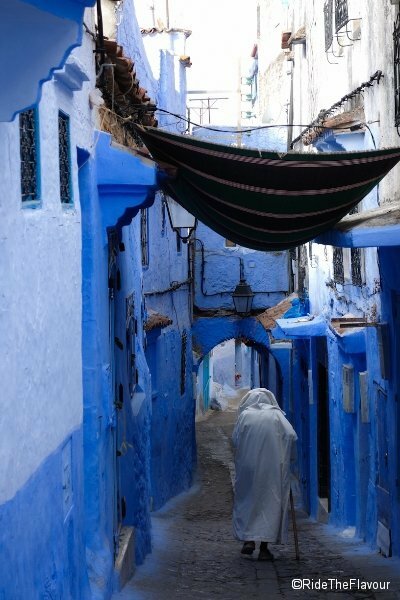 We did not realize it at the time but subsequently, after wandering in several others, Chefchaouen’s is worth a look. The blue that colors the walls makes it absolutely unique. 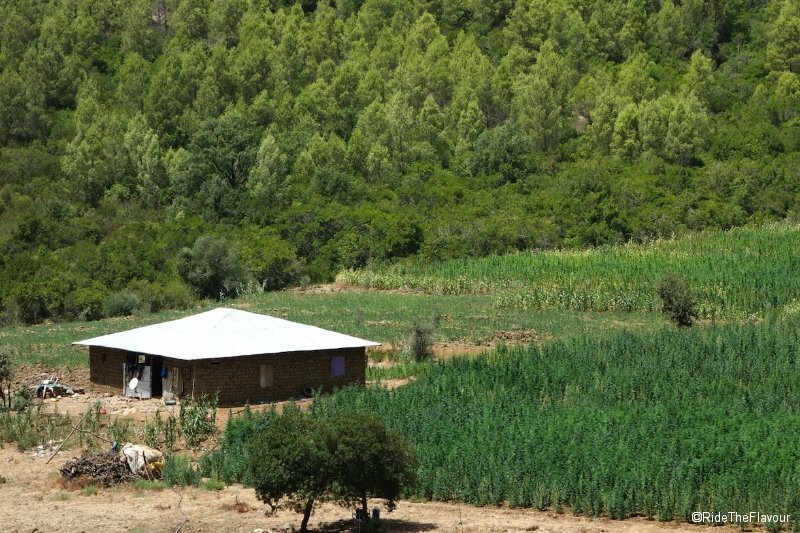 By the way, a water source neighbors the medina … A blessing for us! 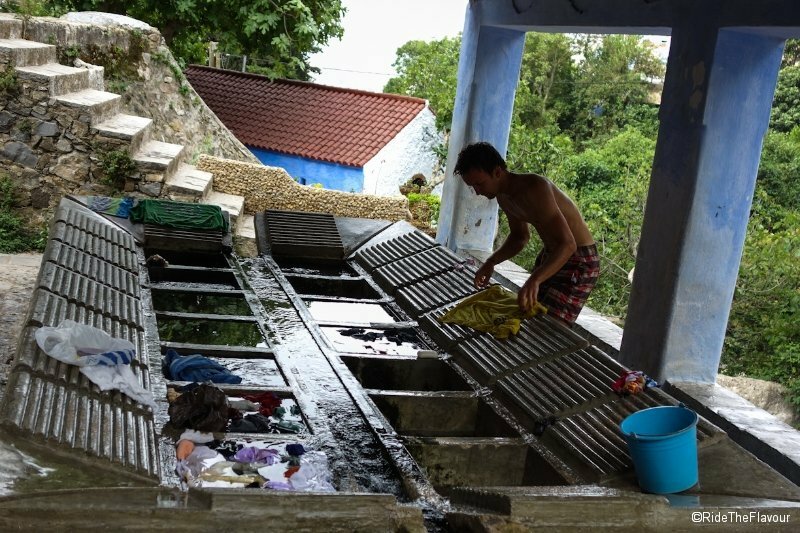 We left the sea, so that we now have fewer opportunities to cleanse us and wash our clothes. Is that all about Chefchaouen? 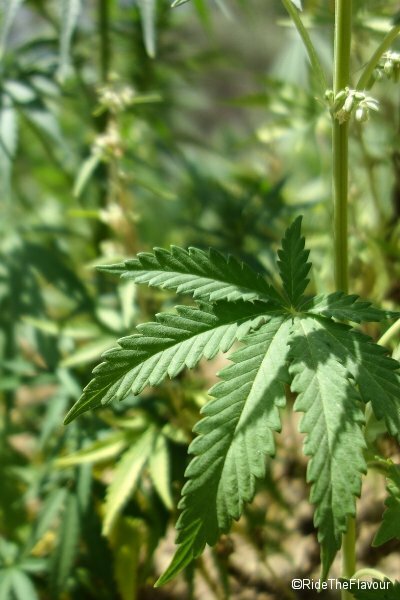 Oh no, we cannot omit to tell you about cannabis! Cannabis is omnipresent. In Chefchaouen, we were constantly offered to buy some. 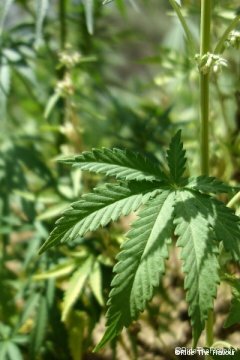 On the roads around, we regularly meet young dealers, alone in the middle of nowhere, miming “cannabis” (rolling or smoking a joint in the air). At the end of the day, fights break out, embittered by the lack imposed by fasting. In the evening, the smell of cannabis announces the end of fasting as surely as the muezzin does. We arrive in Fez from the North. 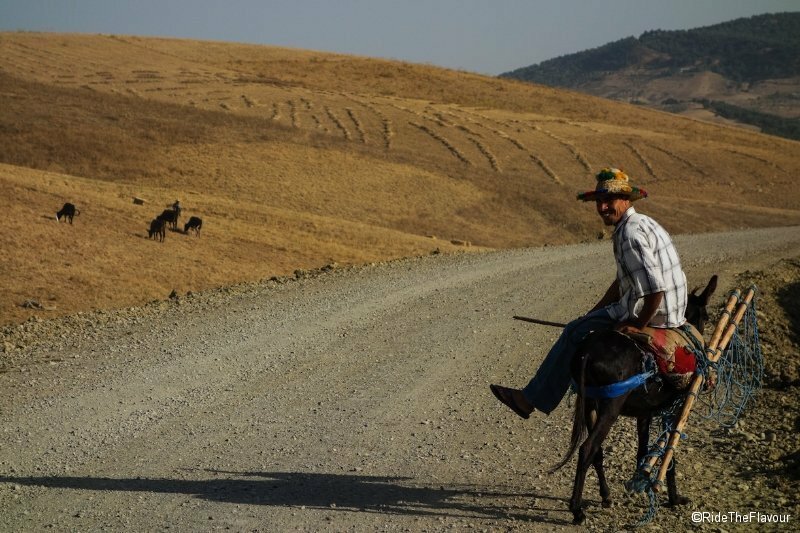 The road rises from the mountainous area to offer us a magnificent panorama of the region. 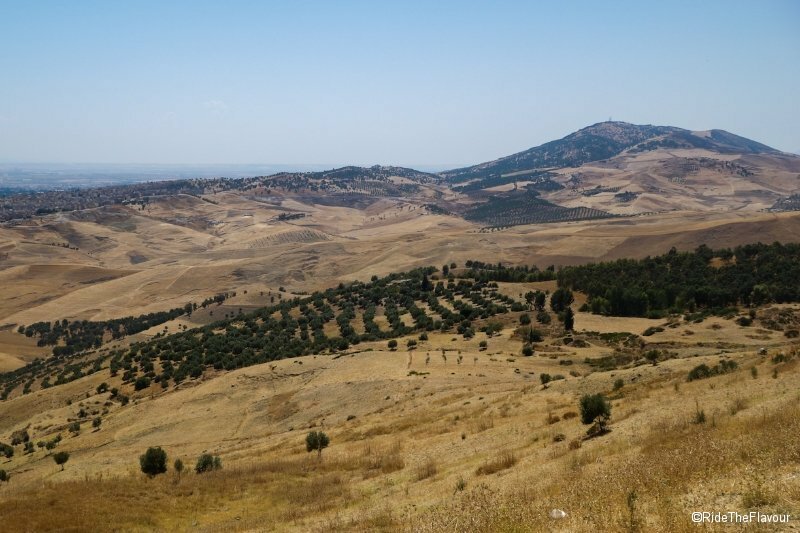 The third most populous city in Morocco actually seems small in the vast ocean of wheat fields. The landscape is golden. The identity and the charm of Fes are concentrated in the medina, a medina that is not beautiful in itself, but is impressive by its activity! This activity is besides more Moroccan than touristic … Men, carts, donkeys and scooters (despite the ban) follow and cross each other without ever hitting. A miracle in this streets of just two meters wide! The identity and the charm. – We are thinking about sleeping in Ain Aouda. – But where? There is no hotel here. Wrong answer: it is something he does not see, something he even considers dangerous. – Here is the countryside, you’re not safe. (We of course do not say that we have slept in far more rural places!) Either you put the tent in front of the police office, or you go to Rabat and get a hotel room. 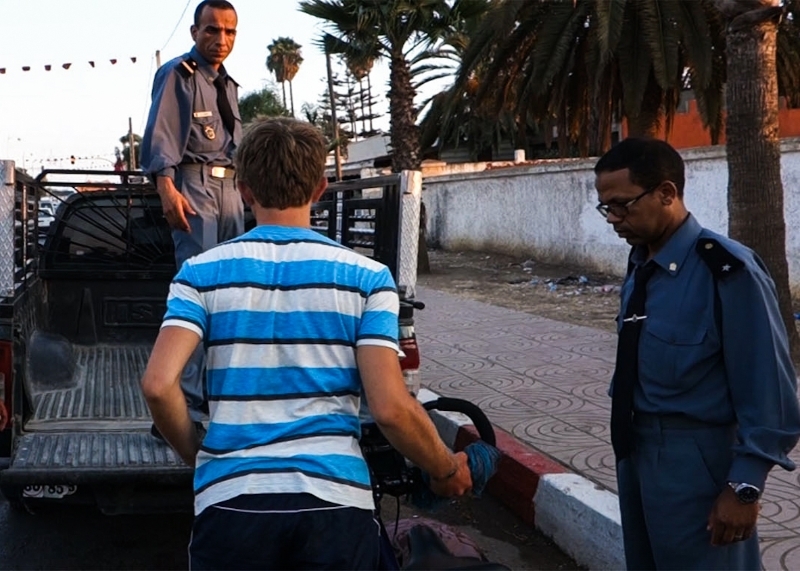 Sleeping on the sidewalk is quite far from our ideal, but going back to Rabat by bike would imply a night ride … Not safe! Finally, the chief of brigade decides to call a pickup truck that will take us and our bikes to Rabat. – You are our guests, your safety is our responsibility. Our policeman friend wishes us fair winds, convinced that we’ll look for a hotel in downtown Rabat. Yet it is not in our plans, we leave the main road and start looking for a disinterested hospitality. This is how we meet Ovidiu and Rodica, and their children Iasmina and Luca. A godsend. The Romanian family welcomes us right away as if we were part of the family. Day after day, we put off the departure and we finally end up spending three full days all together! Three days during which we really are a big family. 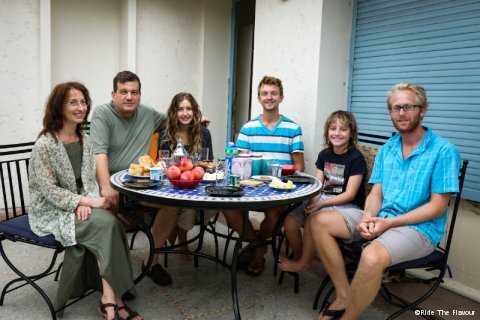 All of them speak French: communication is natural and meals spontaneously liven up with heated discussions. Their views on Morocco, detached from any cultural affiliations, sheds light on many aspects of Moroccan culture. You gave us a stability that we completely lost in the bustle of our Moroccan adventure. You were a real adoptive family. Thank you so much! 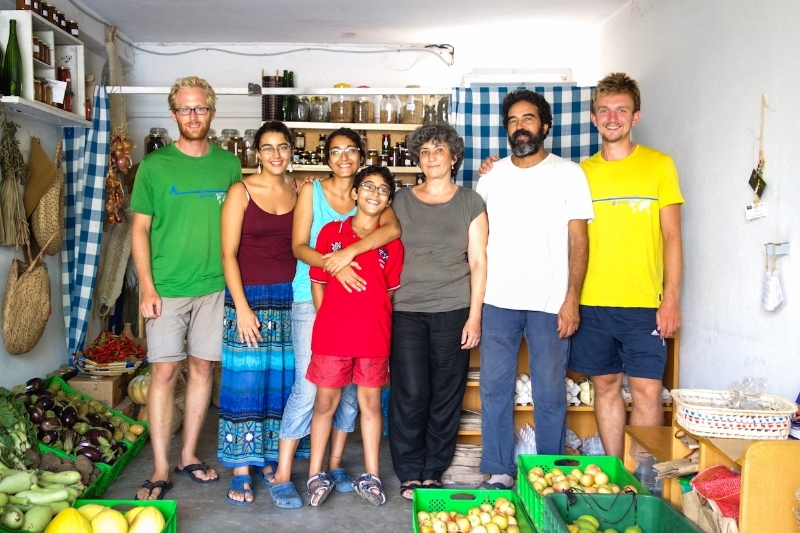 When we talk about our food sovereignty project to Ovidiu Rodica, they immediately think about introducing us to Mohamed and Irene. “They have an organic farm,” they tell us. But it was not until the last moment that we meet Irene. Her words question us and we agree to spend the next day with her, Mohamed and their children … This is much more than organic farm. Their farm is actually a pillar around which a whole philosophy of life gravitate, a philosophy that has fascinated and captivated us, and which we will share with you, notably through a short film. Each day in Morocco brought us a surprise. We lived the last week of Ramadan, the Eid and the “normal life”. 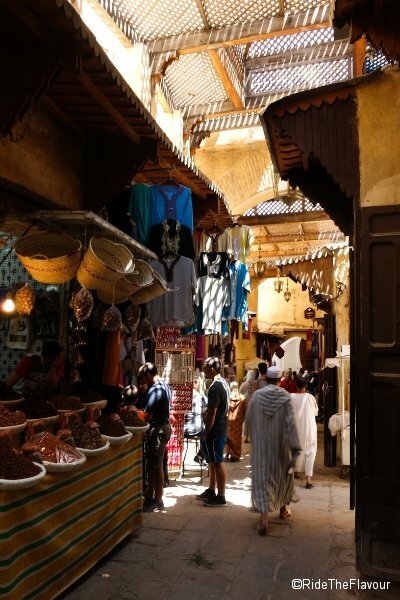 Moroccan culture, closely linked to the Muslim religion, was a daily change of scenery! 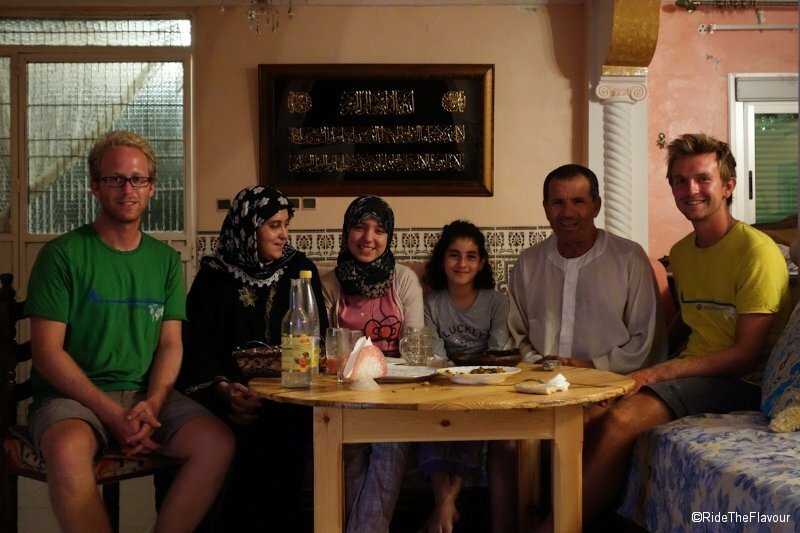 But what touched us most is the Moroccan hospitality. We slept outside only 3 times in 3 weeks. At the end of the day, when we explained our trip and our situation, Moroccans always did their best to find us place to stay. Whether their home, their cousin’s home, their friend’s bar, the premises of the local association, etc. All our hosts without exception were incredibly generous. Each of them showed us a side of Morocco and enriched our trip. There, we did not dread the time to find a home for us and our batteries … We even looked forward to it!